I’ve been involved with Herbal Incense for about 5 years now and am experienced as I’ve tried many blends from many different companies over the years. There are three levels and I have had both level two and three. No matter the level first thing I noticed was a strong fruit scent and there’s a selection of grape, apple, strawberry and blueberry. Level two I purchased the grape scent and was again blown away. The potency rivaled that of level three as again it did not take much to get the desired effect. The incense had the same effects as level three, just not as intense which I thought was better for daily use. Level 3 was a bit strong, but still good. I would definitely recommend for a larger room. The newer Level X is right on the money in my opinion. It has a very mild aroma and is very soothing, much better for a smaller room or small apartment. I used a different brand for years until they recently shut down. The customer service is also amazing. I highly recommend this company to any and all. Five Stars!! I recently received my first order from Atomic Zip, and have absolutely no complaints. I ordered; blueberry level 1, level x, and also received sample bags of strawberry scented level 2 and 3. Gotta say, something enjoyable about every level. I believe I enjoyed the level 2 most for daytime usage, and def found level x to be the best bed side companion, The former seems to actually be slightly energetic, non of the drag typically associated with herbal incenses. The latter on the other hand, has all the drag you could want, it’s great for winding down as you get into bed. A good way to describe level x would be, intensely relaxing. 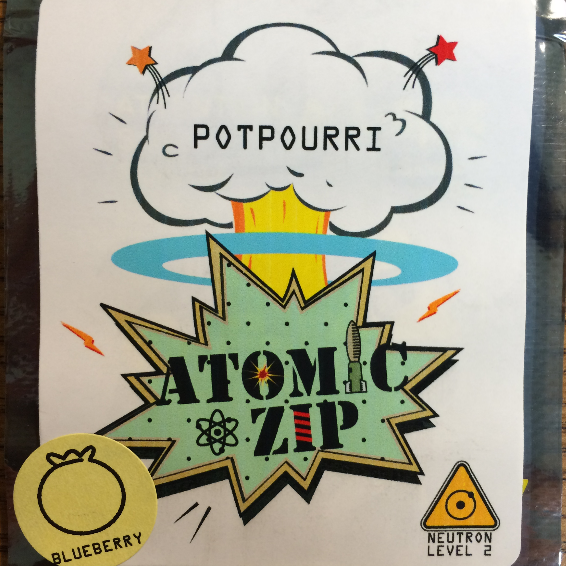 I plan on placing my second order in the next day or two, if on my second order I have an experience less than this I will post a second order review, but for now, nothing but GOOD VIBES from the dudes down at ATOMIC ZIP! Yes can you tell me where i can get atomic zip strawberry? I live in Ms.
Can you send a,free sample to united States by mail?